Our functional resume samples are free resume examples put here to show you exactly how (and when) to use this non-traditional resume format. Functional resumes are not right for most situations. But there are times when this is the best format to use. For example, if you've held a number of different jobs within a short period of time, you could be labeled a "job hopper." Functional resumes, also known as "skills-based resumes" will de-emphasize your jobs, while highlighting your skills, and can be more effective in these situations. You'll group your skills into different categories. The bottom line is, a skills-based focus allows you to emphasize your strengths, while soft-pedaling gaps in employment or a less-than-stellar employment record. As you can see by the functional resume samples below, the employment history section of your resume will be brief, with a simple list of positions held, company names and employment dates towards the end of the resume. Unfortunately, functional resumes can also raise questions, especially if they seem to be concealing something. So, weigh the pros and cons carefully before proceeding. 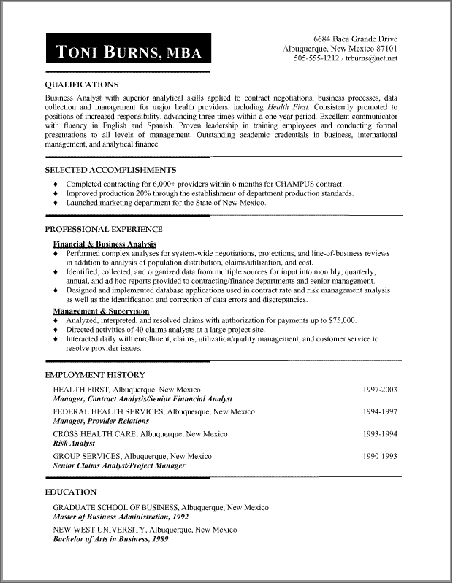 Here are a couple of functional resume samples from our friends at ResumeEdge.com . If you decide to go with the functional resume format, be sure to use these functional resume samples as an easy reference to how to do it the right way. But also remember... free resume examples like these are only a guideline. Your resume must reflect who you are.